The social structure of the United Kingdom has historically been highly influenced by the concept of social class, with the concept still affecting British society in the early-21st century. British society, like its European neighbours and most societies in world history, was traditionally (before the Industrial Revolution) divided hierarchically within a system that involved the hereditary transmission of occupation, social status and political influence. Since the advent of industrialisation, this system has been in a constant state of revision, and new factors other than birth (for example, education) are now a greater part of creating identity in Britain. Although definitions of social class in the United Kingdom vary and are highly controversial, most are influenced by factors of wealth, occupation and education. Until recently the Parliament of the United Kingdom was organised on a class basis, with the House of Lords representing the hereditary upper class and the House of Commons representing everyone else. The British monarch is usually viewed as being at the top of the social class structure. British society has experienced significant change since the Second World War, including an expansion of higher education and home-ownership, a shift towards a services-dominated economy, mass immigration, a changing role for women and a more individualistic culture, and these changes have had a considerable impact on the social landscape. However, claims that the UK has become a classless society have frequently been met with scepticism. Research has shown that social status in the United Kingdom is influenced by, although separate from, social class. 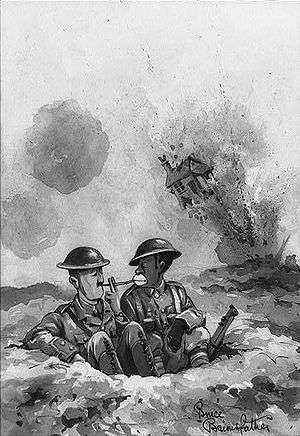 World War I cartoon by Bruce Bairnsfather "The Growth of Democracy: Colonel Sir Valtravers Plantagenet gladly accepts a light, during a slight lull in a barrage, from a private in the Benin Rifles"
The biggest current study of social class in the United Kingdom is the Great British Class Survey. Prior to the eighteenth century, one did not speak of class or classes. Older terms like estates, rank, and orders were predominant. This change in terminology corresponded to a general decrease in significance ascribed to hereditary characteristics, and increase in the significance of wealth and income as indicators of position in the social hierarchy. The "class system" in the United Kingdom is widely studied in academia but no definition of the word class is universally agreed to. Some scholars may adopt the Marxist view of class where persons are classified by their relationship to means of production, as owners or as workers, which is the most important factor in that person's social rank. Alternatively, Max Weber developed a three-component theory of stratification under which "a person’s power can be shown in the social order through their status, in the economic order through their class, and in the political order through their party. Besides these academic models, there are myriad popular explanations of class in Britain. In the work Class, Jilly Cooper quotes a shopkeeper on the subject of bacon: "When a woman asks for back I call her 'madam'; when she asks for streaky I call her 'dear'." The United Kingdom never experienced the sudden dispossession of the estates of the nobility, which occurred in much of Europe after the French Revolution or in the early 20th century, and the British nobility, in so far as it existed as a distinct social class, integrated itself with those with new wealth derived from commercial and industrial sources more comfortably than in most of Europe. Opportunities resulting from consistent economic growth and the expanding British Empire also enabled some from much poorer backgrounds (generally men who had managed to acquire some education) to rise through the class system. The historian David Cannadine sees the period around 1880 as a peak after which the position of the old powerful families declined rapidly, from a number of causes, reaching a nadir in the years after World War II, symbolised by the widespread destruction of country houses. However their wealth, if not their political power, has rebounded strongly since the 1980s, benefiting from greatly increased values of the land and fine art which many owned in quantity. Meanwhile, the complex British middle-classes had also been enjoying a long period of growth and increasing prosperity, and achieving political power at the national level to a degree unusual in Europe. They avoided the strict stratification of many Continental middle-classes, and formed a large and amorphous group closely connected at their edges with both the gentry and aristocracy and the labouring classes. In particular the great financial centre of the City of London was open to outsiders to an unusual degree, and continually expanding and creating new employment. The British working class, on the other hand, was not notable in Europe for prosperity, and Early Modern British travellers often remarked on the high standard of living of the farm-workers and artisans of the Netherlands, though the peasantry in other countries such as France were remarked on as poorer than their English equivalents. Living standards certainly improved greatly over the period, more so in England than other parts of the United Kingdom, but the Industrial Revolution was marked by extremely harsh working conditions and poor housing until about the middle of the 19th century. The social grade classification created by the National Readership Survey over 50 years ago achieved widespread usage during the 20th century in marketing and government reports and statistics. The UK Office for National Statistics (ONS) produced a new socio-economic classification in 2001. The reason was to provide a more comprehensive and detailed classification to take newer employment patterns into account. On 2 April 2013 analysis of the results of a survey, which was conducted by the BBC in 2011 and developed in collaboration with academic experts, was published online in the journal Sociology. The results released were based on a survey of 160,000 residents of the United Kingdom most of whom lived in England and described themselves as "white." Class was defined and measured according to the amount and kind of economic, cultural, and social resources, "capitals", reported. Economic capital was defined as income and assets; cultural capital as amount and type of cultural interests and activities, and social capital as the quantity and social status of their friends, family and personal and business contacts. This theoretical framework was developed by Pierre Bourdieu who first published his theory of social distinction in 1979. In this new model, Prince William, Duke of Cambridge would be considered middle class despite being second-in-line to the throne, as he is a junior army officer and not a general. This may seem to indicate the model is really a set of subdivisions of the middle classes, rather than an all encompassing model. Analysis of the survey revealed seven classes: a wealthy "elite;" a prosperous salaried "middle class" consisting of professionals and managers; a class of technical experts; a class of ‘new affluent’ workers, and at the lower levels of the class structure, in addition to an ageing traditional working class, a ‘precariat’ characterised by very low levels of capital, and a group of emergent service workers. The fracturing of the middle sectors of the social structure into distinguishable factions separated by generational, economic, cultural, and social characteristics was considered notable by the authors of the research. Members of the elite class are the top 6% of British society with very high economic capital (particularly savings), high social capital, and very 'highbrow' cultural capital. Occupations such as chief executive officers, IT and telecommunications directors, marketing and sales directors; functional managers and directors, barristers and judges, financial managers, higher education teachers, dentists, doctors and advertising and public relations directors were strongly represented. However, those in the established and 'acceptable' professions, such as academia, law and medicine are more traditional upper middle class identifiers, with IT and sales being the preserve of the economic if not social middle class. Members of the established middle class, about 25% of British society, reported high economic capital, high status of mean social contacts, and both high highbrow and high emerging cultural capital. Well-represented occupations included electrical engineers, occupational therapists, midwives, environmental professionals, police officers, quality assurance and regulatory professionals, town planning officials, and special needs teaching professionals. The technical middle class, about 6% of British society, shows high economic capital, very high status of social contacts, but relatively few contacts reported, and moderate cultural capital. Occupations represented include medical radiographers, aircraft pilots, pharmacists, natural and social science professionals and physical scientists, and business, research, and administrative positions. New affluent workers, about 15% of British society, show moderately good economic capital, relatively poor status of social contacts, though highly varied, and moderate highbrow but good emerging cultural capital. Occupations include electricians and electrical fitters; postal workers; retail cashiers and checkout operatives; plumbers and heating and ventilation engineers; sales and retail assistants; housing officers; kitchen and catering assistants; quality assurance technicians. The emergent service sector, about 19% of British society, shows relatively poor economic capital, but reasonable household income, moderate social contacts, high emerging (but low highbrow) cultural capital. Typical occupations include bar staff, chefs, nursing auxiliaries and assistants, assemblers and routine operatives, care workers, elementary storage occupations, customer service occupations, and musicians. The precariat, about 15% of British society, shows poor economic capital, and the lowest scores on every other criterion. Typical occupations include cleaners, van drivers, care workers, carpenters and joiners, caretakers, leisure and travel service occupations, shopkeepers and proprietors, and retail cashiers. The term 'underclass' is used to refer to those people who are "chronically unemployed", and in many instances have been for generations. Long-term unemployment, sometimes for generations. Children and teenagers of the underclass are generally associated with 'chav' culture, and the underclass have also been blamed for the 2011 England riots. Traditionally, these people would work as manual labourers. They would typically have left school as soon as legally permissible and not have been able to take part in higher education. Many would go on to work semi-skilled and unskilled jobs on the assembly lines and machine shops of Britain's major car factories, steel mills, coal mines, foundries and textile mills in the highly industrialised cities in the West Midlands, North of England, South Wales and the Scottish Lowlands. However, since the mid-1970s and early-1980s de-industrialisation has shattered many of these communities, resulting in a complete deterioration in quality of life and a reversal in rising living standards for the industrial working class. Many either dropped in status to the working poor or fell into permanent reliance on welfare dependence. Some dropped out altogether and joined the black market economy, while a limited few did manage to climb up to the lower middle class. Some examples of Mosaic geodemographic groups for these people would be classified as Coronation Street or Rustbelt Resilience. Fictional stereotypes include Andy Capp and Albert Steptoe, who is not only unaspirational himself but crushes the aspirations of his son Harold. They are the mainstay of the trade unions and Labour Party vote, but there are also working class conservatives, particularly in the South East of England in the Medway towns of Kent and the east London border areas of suburban Essex, as exemplified by the fictional character Alf Garnett. It has been argued that with the decline in manufacturing and increase in the service sector, lower-paid office workers are effectively working class. Call centres in particular, have sprung up in former centres of industry. 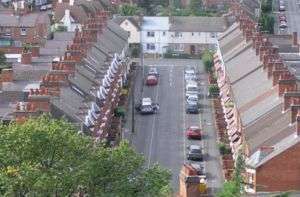 Terraced housing in Loughborough, built for the working classes. "The white working class have prospered hugely since the war. They have experienced unparalleled growth in disposable income and today they are now richer than their parents and grandparents could ever have imagined. There are shared values in white working-class culture but I think it is incredibly difficult to put your finger on exactly what it is that defines 'white working class' because a lot of them are shared by the middle class, such as football and the pub." This class of people would be in skilled industrial jobs or tradesmen, traditionally in the construction and manufacturing industry, but in recent decades showing entrepreneurial development as the stereotypical white van man, or self-employed contractors. These people would speak in local accents and have craft apprenticeships rather than university education. Typical Mosaic types for this group include White Van Culture or Affluent Blue Collar. Trade union membership and Labour Party support is high, but some elements, particularly the demographic known as Essex Man located in the South East of England and the West Midlands are slightly more likely to vote Conservative than the unskilled working class. The British lower middle class primarily consists of office workers and their families living in less affluent suburbs. They are typically employed in relatively unskilled service industry jobs such as retail sales, travel agents, factory and other industrial building owners and low level civil service jobs in local and regional government. Prior to the expansion in higher education from the 1960s onwards, members of this class generally did not have a university education. Members of the lower middle class typically speak in local accents, although relatively mild. Typical Mosaic Geodemographic types for this group include Sprawling Subtopia. Votes in this area are split and minority parties will have a stronger proportion. The comedy character Hyacinth Bucket is a satirical stereotype for this social group. The middle class in Britain often consists of people with tertiary education. They speak in accents that could range from received pronunciation to provincial as well as Estuary English. They may have been educated in either state or private schools. Typical jobs include accountants, architects, solicitors, surveyors, social workers, teachers, managers, specialist IT workers, engineers, doctors, university-educated nurses and civil servants. Displays of conspicuous consumption are considered vulgar by them; instead they prefer to channel excess income into investments, especially property. Members of the middle class are often politically and socially engaged and might be regular churchgoers, sit on local committees and governing boards or stand for political office. Education is greatly valued by the middle classes: they will make every effort to ensure their children get a university education; they may pay for private education, or go to great lengths to get their children into good state or selective grammar schools, such as moving house into the catchment area. They also value culture and make up a significant proportion of the book-buying and theatre-going public. They typically read broadsheet newspapers rather than tabloids. Typical Mosaic geodemographic types would include Provincial Privilege. The comedy character Margo Leadbetter is a satirical stereotype for this group, as is Jilly Cooper's Howard Weybridge. Harrow School. The Public School is traditionally one of the key institutions of the upper-middle-class in Britain. The upper middle class in Britain broadly consists of people who were born into families which have traditionally possessed high incomes, although this group is defined more by family background than by job or income. This stratum, in England, traditionally uses the Received Pronunciation dialect natively. The upper middle class are traditionally educated at independent schools, preferably one of the 'major' or 'minor' "public schools" which themselves often have pedigrees going back for hundreds of years and charge fees of as much as £33,000 per year per pupil (as of 2014). Many upper-middle-class families may have previous ancestry that often directly relates to the upper classes. Although not necessarily of the landowning classes – as a result, perhaps, of lack of a male heir – many families' titles/styles have not been inherited and therefore many families' past status became dissolved. Although such categorisations are not precise, popular contemporary examples of upper-middle-class people may include Boris Johnson, Catherine, Duchess of Cambridge, David Cameron, Helena Bonham Carter (actress), and Matthew Pinsent (athlete). The British "upper class" is statistically very small and consists of the peerage, gentry and hereditary landowners, among others. Those in possession of a hereditary peerage (but not a life peerage) – for example a Dukedom, a Marquessate, an Earldom, a Viscounty or a Barony – are typically members of the upper class. Traditionally, upper class children were brought up at home by a nanny for the first few years of life, and then schooled at home by private tutors. From the late 19th century, it became increasingly popular for upper-class families to mimic the middle-classes in sending their children to public schools, which had been predominantly founded to serve the educational needs of the middle class. Nowadays, when children are old enough, they may attend a prep school or pre-preparatory school. Moving into secondary education, it is still commonplace for upper-class children to attend a public school, although it is not unheard of for certain families to send their children to state schools. Continuing education goals can vary from family to family; it may, in part, be based on the educational history of the family. In the past, both the British Army and Royal Navy have been the institutions of choice. Equally, the clergy, as well as academia, particularly within the arts and humanities divisions of Britain's oldest and most prestigious universities (Oxbridge), have been traditional career paths amongst the upper class - indeed until 1840 the majority Oxbridge graduates were destined for ordination. Received Pronunciation, also known as RP or BBC English, was a term introduced as way of defining standard English, but the accent has acquired a certain prestige from being associated with the middle (and above) classes in the South East, the wealthiest part of England. Use of RP by people from the 'regions' outside the South East can be indicative of a certain educational background, such as public school or elocution lessons. "The Queen's English" was once a synonym for RP. However, the Queen and some other older members of the aristocracy are now perceived as speaking in a way that is both more old fashioned and higher class than "general" RP. Phoneticians call this accent "Conservative Received Pronunciation". The Queen's pronunciation has, however, also changed over the years, moving perceptibly towards the vowels of Estuary English. BBC English was also a synonym for RP; people seeking a career in acting or broadcasting once learnt RP as a matter of course if they did not speak it already. However, the BBC and other broadcasters are now much more willing to use - indeed desire to use - regional accents. Language and writing style have consistently been one of the most reliable indicators of class, although pronunciation did not become such an indicator until the later 19th century. The variations between the language employed by the upper classes and non-upper classes has, perhaps, been best documented by linguistic Professor Alan Ross's 1954 article on U and non-U English usage, with "U" representing upper and upper middle class vocabulary of the time, and "Non-U" representing lower middle class vocabulary. The discussion was furthered in Noblesse Oblige and featured contributions from, among others, Nancy Mitford. The debate was revisited in the mid-1970s, in a publication by Debrett's called U and Non-U Revisited. Ross also contributed to this volume, and it is remarkable to notice how little the language (amongst other factors) changed in the passing of a quarter of a century. There are many inconsistencies and subtleties that many believe are far more important to the British system than a person's assets. For example, many believe that referring to one's self as 'classy' or even using the word 'class' in such a context is indicative of a lower class. Other examples include the way a person holds their knife and fork to eat, the way a person pronounces the letter 'h,' the way a person pronounces 'scone,' how well a person respects others, and even the care taken by a person to uphold the rules of grammar in conversation and when punctuating a sentence. In England, the upper class or prestige dialect is almost always a form of RP; however, some areas have their 'own' prestige dialect, distinct from both RP and the working class dialect of the region. Yorkshire dialect the accent of the Yorkshire region with some slight variation between the north and south of the county. Manchester dialect the accent and dialect of Manchester and the surrounding area. Scouse – The accent and dialect of Liverpool, especially strong in Merseyside's working-class population. Brummie – The accent and dialect of Birmingham. The Black Country accent and dialect of the West Midlands, which is similar to but distinctive from Brummie. Geordie – An accent and dialect of north-east England, particularly the Tyneside area. Mackem – An accent and dialect of Sunderland and surrounding areas. Cockney is traditionally the working class accent of East London. It also has distinct variations in grammar and vocabulary. The London accent is a more broadly defined working and lower middle class accent than Cockney. Estuary English – A working class and lower middle class accent from Southeast England, basically a milder (closer to R.P.) form of the London accent, showing a tendency to supplant received pronunciation. Mockney is a term used in popular media for a deliberate affectation of the working-class London (Cockney) accent by middle-class people to gain "street credibility". However, phoneticians regard the infusion of Estuary features into received pronunciation among younger speakers to be a natural process. Multicultural London English (abbreviated MLE), colloquially called Jafaican, is a dialect (and/or sociolect) of English that emerged in the late 20th century, and is used mainly by young, inner-city, working-class people in inner London. It is said to contain many elements from the languages of the Caribbean (Jamaica and Trinidad & Tobago), South Asia (Indian subcontinent), and West Africa, as well as remnants of traditional Cockney. Although the street name, "Jafaican", may seem imply that it is "fake" Jamaican, research indicates it is "likely that young people have been growing up in London exposed to a mixture of second-language English and local London English and that this new variety has emerged from that mix", the etymology being the "af" an "can" from "African". Canting arms of Queen Elizabeth The Queen Mother. An English citizen with arms registered in the College of Arms, or a Scottish citizen in the Lyon Court, can be referred to as armigerous. Any British citizen can apply for arms from their respective authority but only those of sufficient social standing would be granted arms. Arms in and of themselves are imperfectly aligned with social status, in that many of high status will have no right to arms whilst, on the other hand, those entitled to arms by descent can include branches of families from anywhere on the social scale. Nevertheless, a right to bear arms under the Law of Arms is, by definition, linked either to the personal acquisition of social status, inspiring application for a personal grant of arms, or to descent from a person who did so in the past. Rightly or wrongly, therefore, the use of a coat of arms is linked to social prestige. In the early twentieth century, it was argued by heraldic writers such as Arthur Charles Fox-Davies that only those with a right to a coat of arms could correctly be described (if men) as gentlemen and of noble status; however, even at the time this argument was controversial, and it was rejected by other writers such as Oswald Barron and Horace Round. In the Order of Malta, where proof of technical nobility is a requirement of certain grades of membership, British members must still base their proof upon an ancestral right to a coat of arms. If one asks oneself what are the true reasons for the differentiated development of societies and economies between the British and most ones on the Continent, I think it has something to do with the fact that British society, much more than the Scandinavian, German, Austrian, and Dutch societies, is characterised by a class-struggle type of society. This is true for both sides of the upper class as well as for the working classes. I think that the way in which organised Labour on the one hand and industrial management on the other had dealt with their problems is outmoded. You have to treat workers as equal members of society. You have to give them the self–esteem which they can only have if they acquire responsibility. Then you will be able to ask the trade unions to behave and to abstain from those idiotic policies. Then they will accept some guidance from outsiders—from the government or the party or whatever it is. But as long as you maintain the damned class-ridden society of yours you will never get out of your mess. Mosaic (geodemography) – system designed to classify Britain by postcode, into 11 main groups and 61 types. ↑ Biressi, Anita; Heather Nunn (2013). Class and Contemporary British Culture. London: Palgrave Macmillan. ISBN 9780230240568. ↑ "Changing Social Class Identities in Post-War Britain: Perspectives from Mass-Observation by Mike Savage". Sociological Research Online. Retrieved 19 October 2011. ↑ Chan, Tak Wing; Goldthorpe, John (2004). "Is There a Status Order in Contemporary British Society?" (PDF). European Sociological Review. Oxford Journals. 20 (5): 383–401. doi:10.1093/esr/jch033. Retrieved 24 December 2011. ↑ Kuper, Adam, ed. (2004). "Class, Social". The social science encyclopedia. Taylor & Francis. p. 111. ISBN 978-0-415-32096-2. ↑ Cloake, Felicity (8 March 2012). "How to cook the perfect bacon sandwich". The Guardian. London. ↑ Engels, Frederick. The Condition of the Working-Class in England in 1844. Translated by Florence Kelley Wischnewetzky (January 1943 George Allen & Unwin reprint of the March 1892 edition by David Price ed.). Project Gutenberg. Retrieved April 4, 2013. ↑ "Britain's Real Class System: Great British Class Survey". BBC Lab UK. Retrieved April 4, 2013. ↑ Savage, Mike; Fiona Devine; Niall Cunningham; Mark Taylor; Yaojun Li; Johs. Hjellbrekke; Brigitte Le Roux; Sam Friedman; Andrew Miles (April 2, 2013). "A New Model of Social Class: Findings from the BBC's Great British Class Survey Experiment". Sociology. doi:10.1177/0038038513481128. Retrieved April 4, 2013. ↑ "The Great British class calculator: People in the UK now fit into seven social classes, a major survey conducted by the BBC suggests.". BBC. April 3, 2013. Retrieved April 4, 2013. ↑ Mike Savage; Fiona Devine (April 3, 2013). "The Great British class calculator: Sociologists are interested in the idea that class is about your cultural tastes and activities as well as the type and number of people you know.". BBC. Retrieved April 4, 2013. 1 2 Mike Savage; Fiona Devine (April 3, 2013). "The Great British class calculator: Mike Savage from the London School of Economics and Fiona Devine from the University of Manchester describe their findings from The Great British Class Survey. Their results identify a new model of class with seven classes ranging from the Elite at the top to a 'Precariat' at the bottom.". BBC. Retrieved April 4, 2013. ↑ Sarah Lyall (April 3, 2013). "Multiplying the Old Divisions of Class in Britain". The New York Times. Retrieved April 4, 2013. ↑ Page 2 "A New Model of Social Class: Findings from the BBC’s Great British Class Survey Experiment"
↑ Pages 11 to 15 "A New Model of Social Class: Findings from the BBC’s Great British Class Survey Experiment"
↑ "Professor salaries break the scale". Times Higher Education. Retrieved 17 August 2013. ↑ Pages 12 and 13 "A New Model of Social Class: Findings from the BBC’s Great British Class Survey Experiment"
↑ Pages 12 to 14 "A New Model of Social Class: Findings from the BBC’s Great British Class Survey Experiment"
1 2 3 4 Pages 12 and 14 "A New Model of Social Class: Findings from the BBC’s Great British Class Survey Experiment"
↑ Pages 12, 14, and 15 "A New Model of Social Class: Findings from the BBC’s Great British Class Survey Experiment"
↑ "Social Class (social differentiation)". Encyclopaedia Britannica. ↑ Charlie Taylor (7 March 2012). "How we can turn the underclass around". London: telegraph.co.uk. ↑ Mark Easton (11 August 2011). "England riots: The return of the underclass". bbc.co.uk. 1 2 Jilly Cooper Class: a view from middle England. Eyre Methuen. Retrieved 2009-10-04. ↑ Bell, Dan (14 March 2008). "Who are the white working class?". BBC News. 1 2 Kate Fox, Watching the English: The Hidden Rules of English Behaviour. Nicholas Brealey Pub. Retrieved 2009-10-04. 1 2 Palliser, David Michael; Clark, Peter; Daunton, Martin J. (2000). The Cambridge Urban History of Britain: 1840–1950. Cambridge. p. 679. ↑ "Thank God I don't have that ghastly sense of entitlement that Eton instils". The Spectator. 17 December 2011. ↑ Byrnes, Sholto (20 April 2010). "Who's posher: Clegg or Cameron?". The Guardian. ↑ Farndale, Nigel (28 January 2013). "Is there a private school prejudice?". The Daily Telegraph. ↑ Harrington, Illtyd (17 July 2008). "New Mayor Boris Johnson opens next chapter". Camden New Journal. ↑ Johnson, Richard (22 November 1999). "Boxing Helena". Los Angeles magazine. ↑ Macintyre, Ben (27 March 2007). "Upper middle-class". The Times. ↑ Frances Knight (1998). The Nineteenth-Century Church and English Society. Cambridge University Press. p. 107. ISBN 978-0-521-65711-2. ↑ Paul Kerswill (3 July 2010). "The English slanguage". The Sun. London. Retrieved 2011-04-05. 1 2 Harry Mount (1 July 2010). "Word on the street in London". Evening Standard. Retrieved 2011-04-05. ↑ Clark, Laura (2006-04-12). "'Jafaican' is wiping out inner-city English accents". Daily Mail. London. Retrieved 2008-02-02. ↑ Dönhoff, Marion. Foe into friend: The Makers of the New Germany from Konrad Adenauer to Helmut Schmidt. Robson, David (7 April 2016). "How important is social class in Britain today?". BBC News. Retrieved 7 April 2016.